Barbecue ribs hot from the kitchen at Shamus T Bones. There’s one thing constant in the restaurant world: change. Menus change; restaurants come and go. It can be hard to keep track. That’s why we put out a new Menu of Menus every year. There’s a new one out, which you can find on select newsstands and other locations throughout Humboldt County. 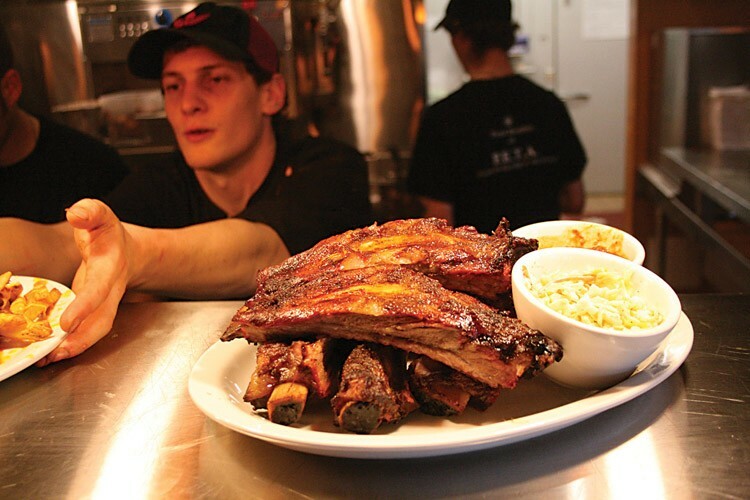 For those who love barbecue, Shamus T Bones in Carlotta has been a destination restaurant. Now former-building-contractor-turned-BBQ-chef Chris Barry has opened his dream restaurant in a brand spanking new rustic-meets-Craftsman building on the waterfront (behind the Best Western Plus Bayshore Inn) with an expansive view of Humboldt Bay. Expect the same Texas-style barbecue menu, heaven for carnivores, but with more seafood, including a full oyster bar, as well as new options for vegetarians. And yes, the awesome collection of mounted trophy heads made the move. When our last Menu of Menus came out we were still waiting for Luke Patterson of Luke’s Joint to open his dinner-house, The Other Place, on K Street in Arcata. It was worth the wait for what is arguably the most innovative menu in the county. Luke calls the food “French-American,” but that’s too limiting for the range of influences in play. Those curious about how he does it, and what goes on in a cutting-edge kitchen, are invited to reserve “The Kitchen Table,” a counter with seating for three right in the restaurant’s kitchen. It’s been a couple of years since Avalon expanded to Arcata with Bizou, a second location offering what was basically the Avalon menu. After spending part of 2011 on hiatus, the space in the Safeway shopping center has reopened as a casual burger joint, Bizou Burger. The new menu includes variations on the classic burger using local grass-fed beef, plus BBQ ribs, pulled pork, Buffalo wings and Caesar salad, all with that Avalon twist. Vegetarian and gluten-free options? Of course. Before Ramone’s established itself as one of Humboldt’s premier bakeries, it was an Old Town restaurant known first as Ramone’s Café, then as Ramone’s at Night. Berit Meyer was among the staff (she’s also a founding owner). She now oversees bakeries in five locations with her husband, Brian Ferguson. About a year ago their production bakery near St. Joseph Hospital took over the neighborhood grocery next door, Duck’s Market, to become Ramone’s Harrison Bakery & Café. The well-appointed space offers the usual bakery fare along with a breakfast menu with egg dishes, French toast and the like. At lunch there's pizza, panini, soups and salads along with daily specials. There’s also a carefully selected wine list, beer on tap and a rotating dinner menu served until 7 p.m. most weekdays, until 9 p.m. Fridays and Saturdays — which means it’s once again Ramone’s at night — if not by name, by schedule. Despite its off-the-beaten-path Eureka location, there’s often a wait for a table at hot spot Brick and Fire Bistro. Not to worry, simply head a couple of doors down F Street to its satellite, Two Doors Down. The cozy wine bar took over the space that once housed World Café. Wait for your table at Brick and Fire and have an appetizer, fondue or a cheese board while you sip a glass of wine. Or have a light meal there. Choose from soups and salads and finish with dessert. You may not notice much of a change, but longtime Northtown Arcata favorite Folie Douce has a new owner, Chris Hollen, who has been a server there for years. One new addition: something she calls “Sweet Sunday Madness” the second Sunday of each month, with appetizers based around ingredients from local famers paired with appropriate regional wines. As 2011 came to an end, longtime Old Town fave Hurricane Kate’s called it quits and baked its last wood-fired pizza. Now Alex Moore from The Pearl (right next door) is taking over. A new name was in order (the original Hurricane Kate blew out of town years ago). He’s going with the address: Five Eleven. Moore has big plans: He’s already enlisted Dave Griswold from the original Kate’s crew as head chef -- he’s working on a menu along locavore Northern Pacific cuisine lines. Interior changes include moving the bar to the other side of the room and building a stage in back for live music. The industrious Moore projects a July opening. He will definitely have a very busy 2012: He also recently took over The Yellow Rose, a bar and grill in Petrolia (the only one in the Mattole Valley) and is rebuilding that from the ground up with plans to reopen in June. When the Journal asked readers to choose their favorite pizza last year, Paul’s Live From New York took home the award. At the time the pizza place was working on a new location on the corner of Seventh and F streets near the Eureka Theater. The big, roomy space is now up and running, turning out the same high quality New York-style pizzas you’ll find in McKinleyville. Z & J Asian Subs opened a couple of years ago in the steel-clad building near Target that once offered drive-through coffee. Z & J’s limited menu -- mainly tasty sub sandwiches and a generous Asian chicken salad -- won enough followers to warrant expansion. Now Z & J has taken over the almost-new Quiznos on Fifth in Eureka, offering the original menu plus: Dinner specials rotate night to night (hickory-smoked prime rib on Fridays). There’s also an array of exotic snacks, soft drinks and juices -- and tables so you can sit and eat. The space on the corner of Fifth and G streets in Eureka has been home to a series of restaurants offering everything from Philly cheese steak sandwiches to Indian food. Next up: Sopai’s Place, a Southeast Asian sandwich/pizza joint operated by Sopai Chum, who comes from the same family that runs Don’s Donuts in Arcata. The old Waterwheel Restaurant in Garberville has been reborn as Sequoia Steak and Pub, serving lunch and dinner six days a week. As you can guess from the name, it’s primarily a steak house, although plans are afoot for seasonal seafood, and it already has the requisite vegetarian options and salad bar, which, says owner Pat Bilandzijah, will always be organic and as GMO-free as possible. Kurt Kramer and company are almost done refurbishing the earthquake-damaged Healy Brothers Building, former home of the Old Town Bar and Grill. That restaurant/bar/nightclub is not returning. Instead, plans are under way for a pub called The Siren’s Song Tavern, with an emphasis on microbrews and small production craft beers. The tavern keepers, Phyllis Barba from the Accident Gallery and her partner Nathan Swenson, a lecturer at HSU, figure they’ll have around 100 different beers on tap and in bottles — that’s right, 100 bottles of beer on the wall. Also offering 100 bottles of beer and a wide array of microbrews on tap, exotic and otherwise, is The Local, which recently opened downstairs in the Professional Building on F Street in Eureka, where Obento Sushi used to be. It follows close on the heels of The Speakeasy, a new, intimate full-service bar on Opera Alley in Old Town. Does that sound like a lot of new places to explore? There will be more before you know it.